David Risberg enjoyed conservation projects. Now his memory will live on through projects all across Missouri. 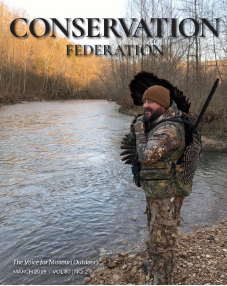 The Conservation Federation of Missouri (CFM) is proud to announce the inaugural application period for the David Risberg Memorial Affiliate Grant Program. “Thanks to the generosity of John and Mary Risberg, and the many donors who followed their lead, CFM now has the ability to offer grants to support the efforts of our nearly 100 affiliated organizations. I am humbled and proud that the Risbergs have placed their trust in CFM to honor David’s memory,” said Brandon Butler, CFM Executive Director. CFM is awarding $10,000 in 2018. This total will be divided into multiple awards up to $2,500. This competitive grants program is only available to CFM affiliate organizations and must be used for advancing conservation priorities through projects and campaigns that grow the conservation movement, and strengthen the affiliate network. “Mary and I are so excited to see this memorial grant program get underway. It is a fitting way to honor our son’s memory, given his lifelong pursuit of conservation efforts. Our intent is to enable grant recipients to expand their own pursuit of such efforts with the funding this program will provide,” said John Risberg. Grant applications are available on the CFM website. The deadline for proposals is February 16, 2018. Scanned email applications sent to bbutler@confedmo.org are preferred. If mailed, they must be postmarked by February 16. Mail to 728 W. Main Street, Jefferson City, MO 65101. Recipients of grants will be notified on or about March 1, 2018. The grants will be awarded at the Affiliate Luncheon during the 82nd annual CFM Convention on March 10, 2018. To donate to the David Risberg Memorial Endowment, Click here.